Ziggy Marley knows all about the requirements for keeping that promo wheel in motion, so Fly Rasta (his new album going on sale this month) is bounds to debut atop the reggae charts. 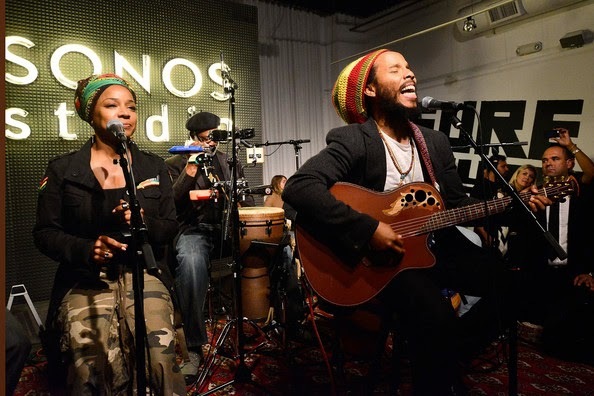 Just this week the Grammy-winning hitmaker was the musical guest of honour inside the Los Angeles-based Sonos Studios or a Q-and-A session aptly dubbed "An Evening with Ziggy Marley," where he not only performed tracks for the live in-studio audience but also rapped with moderator Adam Weissler about art and life. And speaking of hard-working men, Calabash 2014 co-headliner Christopher John Farleywas a recent guest on NBC's The Today Show, where the Game World author joined in a discussion on gender and children's lit. As we previously reported, Farley is set to join fellow literary heavyweights Zadie Smith, Jamaica Kincaid, Ngugi Wa Thiong'O and Salman Rushdie at next month's staging of the Calabash International Literary Festival at Jake's in Treasure Beach, St. Elizabeth. It's always headline-worthy when our artists and artisans get their due. The work of veteran Jamaican screen actor Paul Campbell (Third World Cop, Dancehall Queen, Shottas, Home Again, etc.) will be recognized with a much-deserved career achievement award at the inaugural Oracabessa Music and Culture Festival, slated for May 26 at New York's Roy Wilkins Park. The star power at the event will be turned all the way up, thanks to confirmed mainstage appearances by the likes of Konshens, Beenie Man and Tessanne Chin, who is also set to rock the Catherine Hall massive at Reggae Sumfest in July. Hands down the largest and most comprehensive trade show of its kind in the region, Expo Jamaica 2014 has assembled well over 500 participating entities (a mix of new-kid-on-the-block entrepreneurs and established corporate heavy hitters. It's a fantastic time to ponder the future of business in this country, says Prime Minister Portia Simpson-Miller, who officially opened the expo on Thursday. "We understand that the forces of globalization have changed the face of business everywhere, but for Jamaica to prevail and become more competitive," the prime minister says, "we have no choice but to fully integrate our economy into global value chains for the production and delivery of goods and services around the world." With the Commonwealth Games mere months away (this summer to be precise), Netball Jamaica is stepping up its efforts to ensure that the Sunshine Girls return home with a medal from the July 23-August 3 championship. Hence the return of Aussie miracle-worker Jill McIntosh, who is reprising her role as Technical Director. "The selection committee will look at the best players and the best mix of players," McIntosh says, "so you want a team of twelve that is very harmonious, that works well together on the court, which will allow you to change the combinations and it doesn't matter."